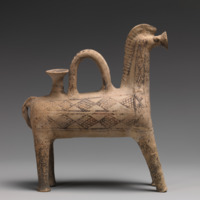 Terracotta Rhyton (Libation Vessel) in the Form of a Horse is a ritual object exemplifying the way the dead were valued both on Cyprus and in the local Aegean civilizations. The rhyton is rather small with an overall size of a shoebox on its side. It is made of light tan terracotta and covered with strips of geometrical patterns painted with matte black paint. 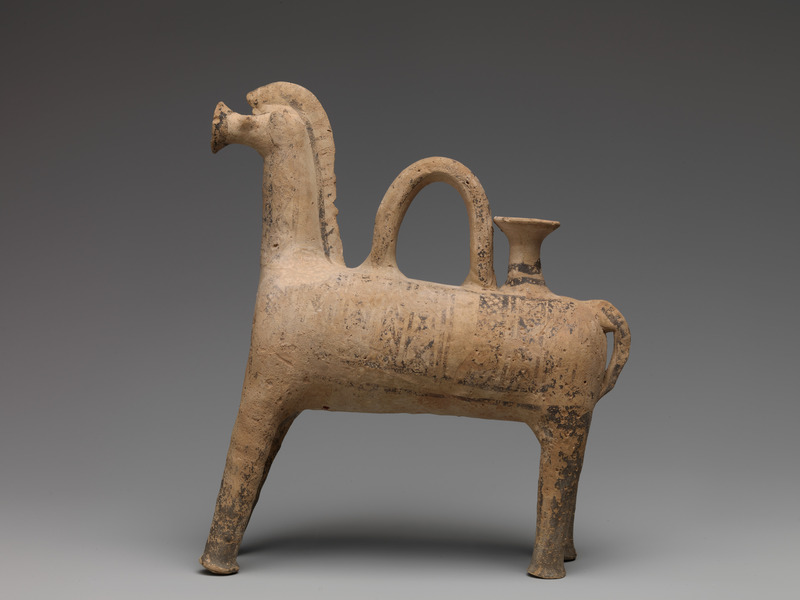 The four legs of the horse are splayed out so that the vessel can stand upright. 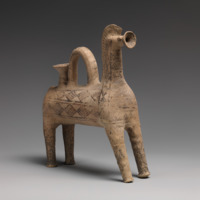 It has a funnel for pouring where the mouth of the horse would be, and a funnel on the horse’s back near the tail of the horse for pouring liquid into the vessel. A tall, thin handle rises from the back of the horse which is placed between the funnel on the back of the horse and the neck of the horse. As the rhyton is not only a ritual object but was found in a tomb, it is a way of looking into the Aegeans’ culture through their traditions pertaining to the veneration of their dead. It suggests the Aegean cultures had a tradition of signaling status after death by burying individuals with important objects in a very similar manner to the cultures which were contemporary to them such as the Egyptians. Furthermore, the rhyton is shaped like an animal, which was common at the time as can be seen in the Cessnola Collection as well as Fig 4.14 in Janson’s History of Art, a Rhyton in the shape of a bull’s head. The materials the rhyton is made out of, clay (terracotta) and black matte paint, are representative of much of the pottery done in this age both in Aegean civilizations and on Cyprus. 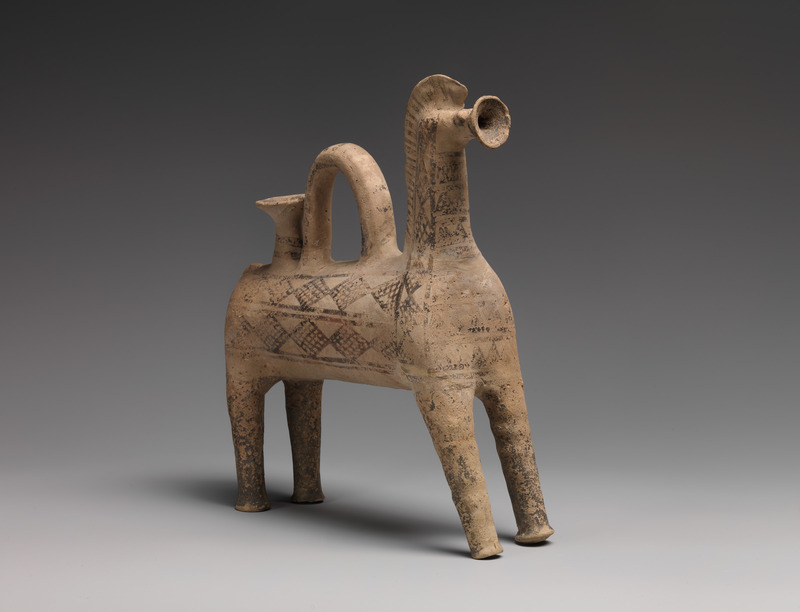 The geometric patterns on the rhyton both ground it in the history of Cypriot prehistoric art as well as calling to mind future use of geometric patterns such as the meander in Greek art. However, perhaps most important is the way the rhyton brings to light the trading between the Aegean civilizations. While the rhyton itself is found on Cyprus, that both the form and the iconography are believed to have possibly originated in a neighboring Aegean civilization shows the degree to which these cultures interacted. This is furthered by the fact the rhyton is proto-white painted ware which is a style that originated on Cyprus, but is of interest due to its blending of elements of different cultures’ artwork. 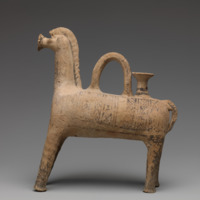 Therefore, Terracotta Rhyton (Libation Vessel) in the Form of a Horse should be used to supplement Chapter 4 of Janson’s History of Art, Ancient Aegean Art, as it is another example of the importance of the rhyton in these cultures, and emphasizes that the civilizations of this period and location as interacting and influencing each other. 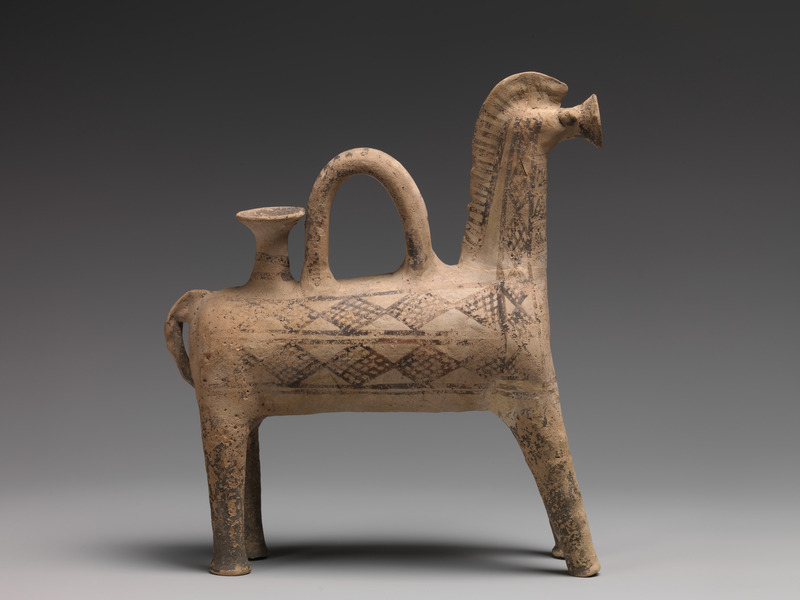 “Terracotta rhyton (libation vessel) in the form of a horse,” accessed April 22, 2019, http://metsurvey.kenyoncip.org/items/show/16.